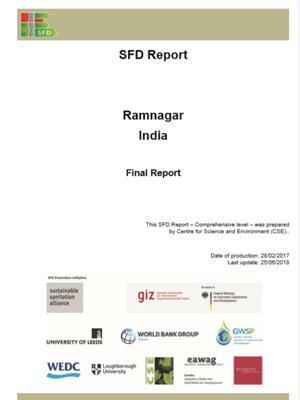 This SFD Report – Comprehensive level – was prepared by Centre for Science and Environment (CSE)..
Ramnagar city is situated on the banks of the Ganga River in the state of Uttar Pradesh, India. The city lies in the IndoGangetic plain. Ramnagar is 28 km away from Varanasi, the district headquarters, and is connected via road and by a temporary pontoon bridge. From a historical point of view, Ramnagar gets its name from Ramnagar fort, which was constructed in the 18th century. It is located on the eastern bank of Ganga River opposite to Varanasi (NPP, 2016).